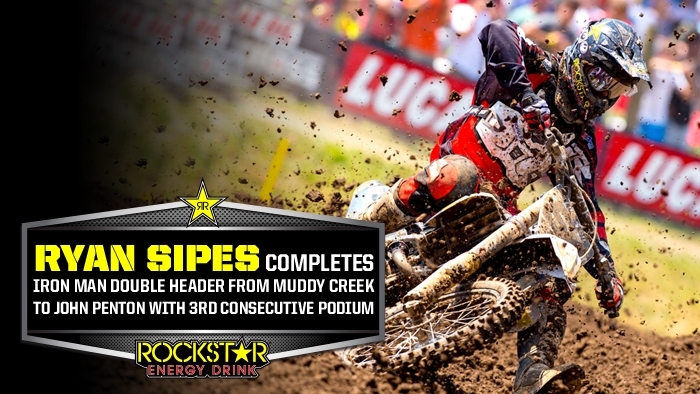 Part 1: "Round 4 of the Pro Motocross Nationals at Muddy Creek went pretty well for me. It was only the 4th time I've been on a 450 this year and I didn't really have a top notch set up. Comin off racin in the woods and almost getting top ten overall, I was definitely happy with that. I felt like I could have ridden a lot better but I can't get mad at 12-10 moto scores." Part 2: "I jumped on air group's plane and we headed up to ohio for round 8 of the GNCC series and it was an awesome day. I didn't have a clue how it would go. I was super tired when I woke up Sunday morning and my legs hurt and everything else, but for me it was more mental than it was physical. I just kept telling myself that you're not tired and you're stronger than this. I started off about 5th and went backwards for a little while until I started feeling better. Then I worked my way up to 2nd and held on to it till the end. Really happy with the whole weekend, the double header, and I'm happy that it was successful to a point. A lot of people called me crazy for trying to do both in one weekend but I feel like we did it. In my eyes it was a success!"